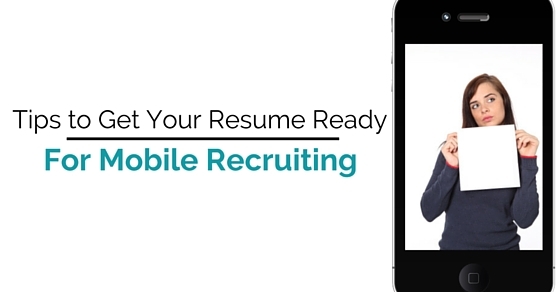 How to Get your Resume Ready for Mobile Recruiting? You should write the resume with a simple approach. This is because; no one would like to pen a link on mobile which is difficult to read. So, if you want the companies to hire you, get ready with the resume in short but with all the authentic information about yourself. Had it your normal paper resume, I would have suggested you to go long in explaining about yourself. But this is about the resumes for the mobile recruiting which demands to be quick just like a click of the button. So, for that you will need to pen down the matter very strategically as it will be difficult for the recruiters to go through the entire document in the small space. Give the most important facts about yourself in the first and the least important in the end. Remember, the reader on mobile wants to read the short messages. So, it is better to compress the content you are going to add. Make the content crisp and engaging or you will let the sand flow from the hand smoothly. Make bullets points to give a quick information. You know you are designing resume for small screen. So, make sure you do not make charts or the tables as they get compressed and uneasy to read. Also use bright colours like dark blue, or red so as to highlight the text easily. Keep the font size large to enhance the readability. One should keep these things in mind while making the resume for the mobile. The worst possible thing is unable to download the resume when the recruiter wants to view it. You may be the best candidate for them but the recruiters are hard pressed with time, so they will never wait for your resume to open after too long. They will rather reject it, which you cannot survive, though. So, the best way is to resort to simplicity as the complex material in the resume makes the file heavy, forming difficulty in downloading. Staying out is fruitless when you cannot reach out to the recruiter directly to contact you. The best and the easy way to reach out to the recruiters easily is add your hyperlinks to the contact numbers and the email. So that the recruiters do not find difficult to contact you. The complex sentences fails to make the readers understand what they want to say as the sentences are too long. The reader may fail to connect the initial meaning of the sentence until one reaches the end of the sentence. Just because it is too long. So, do not give the recruiter a chance to bounce from your resume and select other’s. As you tend to write in short sentences, the grammatical mistakes are caught by the eyes without difficulty. So, make sure there is no grammatical mistake as more the errors, more the bad impression will be created. The recruiters get lots of resumes in a day, so you should not give a chance to them to find any mistake from the resume. It is good to make resume on the latest version of the Microsoft as the resume on the outdated version will not support the format. People very often change their mobile sets and every new mobile sets have different versions. So to prevent the problem of downloading or viewing of the resume, you should create resume on the latest version of the Microsoft on mobile phones. The resume you create must be posted on other social networking sites also. The networking sites like linkedIn, the personal website, academia.com or the twitter etc also you can post the resume links. By this, the availability of the resume will enhance. Also the virtual resumes will be as impressive as the printed ones. Some of the job applications or the websites are there which help promoting your resume, thus getting you a descent and desired job. Various job based applications and the websites like shine.com, etc. should be used as those help in tracking the responses, comments. Also you are able to know who contacted you with in a span of one week and so on. Such detailed information is not received otherwise on any other format. Filtering resume is checking it again and again before finalizing the resume to be uploaded. You must go through the resume once so that no errors are left for the recruiters to find out. Once you write the resume, get it checked from the experienced people as they would tell you the mistakes and you could improve them. Being professional means commiting no mistakes. If you will make lots of mistakes, the question on the efficiency would raise and it should certainly not happen. The less the misatkes, the more chances of getting hired will swell. Ultimately the aim is to get recruited, so leave no stone unturned to get the work done. The resume must have a passport size photograph, as the recruiter may find the resume not real. So, to prove that it’s only you, add a passport size photo in the resume. The photograpgh should not be of the duck pout, needless to mention but still for the sake of awareness; do not do this big mistake. Before you finalize the resume, check it on different devices like on phones, tablets, kindle etc. Besides this, try to open the resume on android as well as iphone as both have different screen sizes for the documents. There is nothing worst than document not able to open successfully when it’s time to view. So, check your resume well on both mobile and the tablet to ensure it’s authenticity and easy availability. You should extract as many benefits as you can from the recent technologies. The QR code are now being used at all the events, job fairs, for all kind of candidates. You can get your own QR code for the resume and let others view the resume easily. Currently these QR codes are used and helps in knowing the recruiters that you are an early adopter of the new technology. This also increases the chances of getting selected. It is not the print resume, neither you have enough space to write whole essay type things in it. So, do not mention any references in the resume and just talk about yourself in pointers, make sure you do not go very long when it comes to writing. As the screen of the mobile is small, the fonts if kept small will look extra small when it comes to the screen of the phones. Making sure the readers do not zoom the text to read, keep the font large at first instance only, to avoid all the inconvenience. Use bold and large fonts as the large fonts are easy to read and also looks appealing. Colorful resume means attractive resume. You can make resume attractive only if you make use of the bright colours like red, green, dark blue and so on. The dark colours makes the resume distinct from others and also catches the eyes attention; keeping the reader hooked. The resume should not have the non spaceous content. There should be enough white space between the content so as to make the eyes feel relax. Also for the easy reading too, leave some space between the content you write. Do not give much space as more white space will affect the alignment and affect the presentation. So, keep it spacious enough to maintain the balance and the presentation perfect. Creating a good presentation, inclusive of all the vital points is although difficult as not everyone is familiar with adjustment of content within small space. So, it may take time but it is important to make the look of resume easy going for the eyes and attractive enough to hook the readers or the recruiters. When you make a resume, make sure to write down all the experience you had in the field. This is because the experience is the need of the companies. Although it is not the format for the printed resumes yet is essential when it comes to giving a quick overview of yourself on mobile. After writing the experiences, pen down the qualification. Then move towards the achievements, qualities, skills, hobbies and so on. Smart approach means intellectual submission. This can happen only when you make best as well as optimum use of the smart technology. The smart approach in making the resume should be adopted as it not only attracts the recruiter but also increases the chances of getting selected. So, go for something different when making a resume. Although no one adds a video in the resume, but why to follow the bandwagon? Go for something different like uploading the video of your experience, the skills you possess, the hobbies you have and so on. the video should not be too long. Just like the resume, it should also focus on the short content that you speak. This is because of the same reason that recruiters will shut down the video if it will go very long and boring. So, make sure the video is also precise and relevant. Whatever the email address and the contact number you write on the resume, should be accurate. Otherwise you may have to undergo a downfall. After all the recruiter will not make an effort to reach up to you, to give you a job. It is you who has to grab an opportunity. So, it is your duty to recheck the number and the email address twice before uploading the resume on the social networking site or anywhere else. So, above are some of the points that one should keep in mind while making a resume for the mobile recruiting. One principle that everyone should keep in mind while getting the resume ready for the mobile recruiters is “short is great”. The more precise you will be, the more will the recruiter read between the lines. The more essay type you will write, the recruiter wil get lost; figuring out what you wish to say and highlight. So it’s better to use a smart approach; avoiding wastage of your as well as the recruiter’s time.